Dear Readers, Important Practice Reasoning Questions for RBI Grade B 2017 Exam was given here with Solutions. 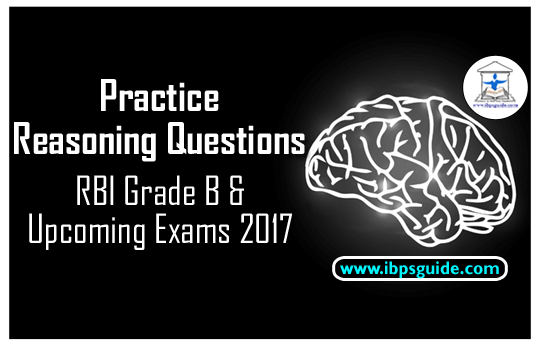 Aspirants those who are preparing for RBI Grade B& and all other Competitive examination can use this. And step V is the last step of the above input, as the desired arrangement is obtained. As per the rules followed in the above steps, find out in each of the following questions the appropriate step for the given input. 1). Which step number is the following output? 2). If in Step IV ‘salary’ is related to ‘36’ and ‘customer’ is related to ‘viewer’, in the same way, ‘indignity’ is related to which of the following? 3). Which word/number would be at the 5th place from the left in Step IV? 4). How many steps would be required to get the final output? 5). Which of the following represents the position of ‘imagination’ in the third step? 6). Which of the following is the fourth element from the left end of Step VI? 7). Which of the following is Step III of the given input? 8). Which element is fourth to the right of ‘giant’ in Step V? 9). How many steps will be required to complete the given input? 10). What is the position of ‘music’ from the left end in the final step? The machine rearranges the words that are not followed by number according to the number of alphabets in each word in ascending order. The words which are followed by numbers are placed thereafter in alphabetical order along with the numbers. Words are arranged in reverse alphabetical order and the numbers are arranged in ascending order. One word and one number is arranged in each step. The arrangement is done from right to left.